In what is becoming something BIGGER than just gaining the Speakership? 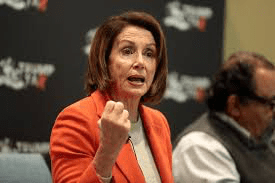 It seems Nancy Pelosi is gaining support to be the person…. Pelosi allies have been insisting that a vote against her on the floor, where she needs a majority of the House to win the gavel, would effectively be supporting a Republican for speaker — though technically members can vote for a Democrat other than the nominee…..
Stephen Lynch comes from Massachusetts, but came up through the building-trades unions and is on the conservative end of the all-Democratic Mass. delegation. The piece kinda assumes the anti-Pelosi faction IS conservative Democrats like the ‘Blue Dogs’….